I'm pretty into inspiring quotes on Pinterest. I have an entire board dedicated to words, and I know I can always pop over there for some perspective and encouragement. Here are some of the quotes I've been loving recently and how they've been helping me move towards my goals. 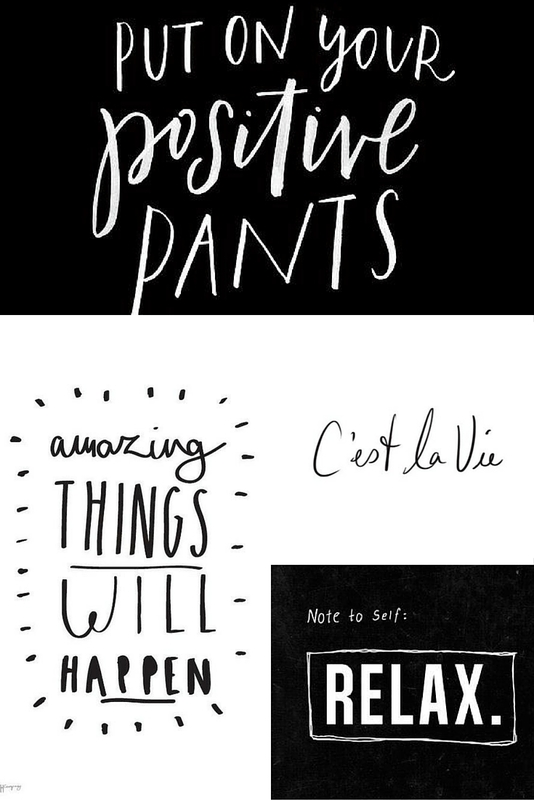 "Put on your positive pants"
Nothing good comes out of a bad attitude, so this reminds me to stay encouraged and positive regardless of the situation. Sure, sometimes (read: often) things won't go according to plan, but approaching it with positivity is your best bet to turn it around. When we are disciplined and take small steps everyday to reach our goals, you better bet amazing things will happen! This is not to say that we need to constantly be looking to the future and imaging what is coming, while failing to appreciate the present. Rather, it is a way to keep us motivated and moving forward, confident in the knowledge that our work will pay off. Or "That's life," is for those times when you can't figure out why in the world something happened/didn't happen/she did that/he didn't do that...and have no option other than to shrug your shoulders and chalk it up to life. Not everything that happens can be explained, and this reminds me that trying too hard to figure it out won't get you anywhere. I need this reminder CONSTANTLY! I have the tendency to let things outside of my control upset me and have to recognize that sometimes there's nothing you can do other than relax and see how it plays out. This is a great reminder for anyone who finds themselves getting worked up, only to realize later how silly they were. What are your recent favorite quotes? Follow my entire Words board! Follow Alyssa J Freitas's board Words on Pinterest.